This weekend I am heading off to sunny Adelaide for a little sojourn to enjoy some wineries, enjoy some music (Florence and the machine!) and to hang out with a posse of awesome chicks. And speaking of awesome chicks, I thought I would share this beautiful issue celebrating Australian women from 1975 before I head out of town. 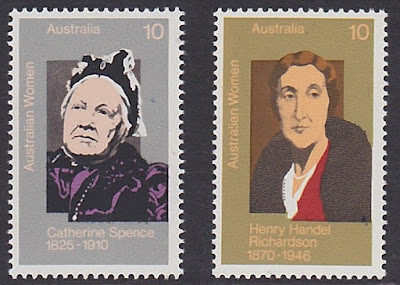 Even though I sometimes call myself a historian, I was not familiar with a couple of the women featured on these stamps, I am ashamed to say. So I looked them all up on the Australian Dictionary of Biography and found that all six were remarkable and inspiring women and leaders in their fields. I have included a line about each of them and a link to their ADB page, for good measure. 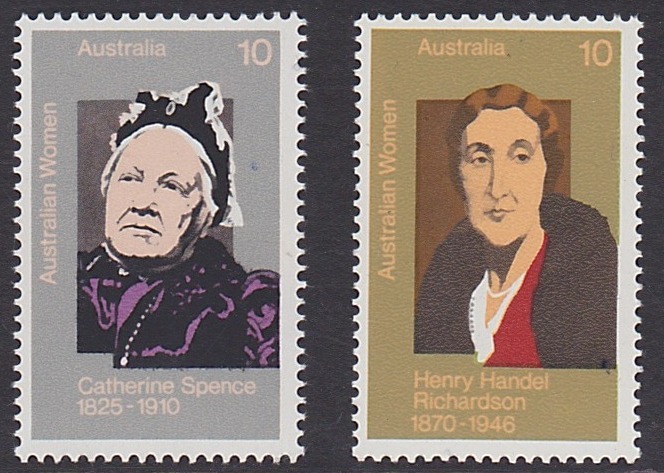 Catherine Spence was a suffragette and author, who, incidentally, was from Adelaide. Henry Handel Richardson is the author of 'The Fortunes of Richard Mahoney' which I bought a lovely second-hand copy of earlier this year... but it is still sitting in my 'to read' pile. 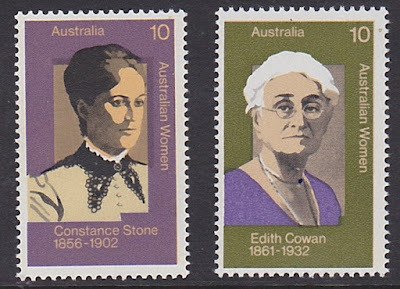 Constance Stone was a Doctor, educated overseas at a time when Melbourne University still did not allow women to enroll in medical degrees. 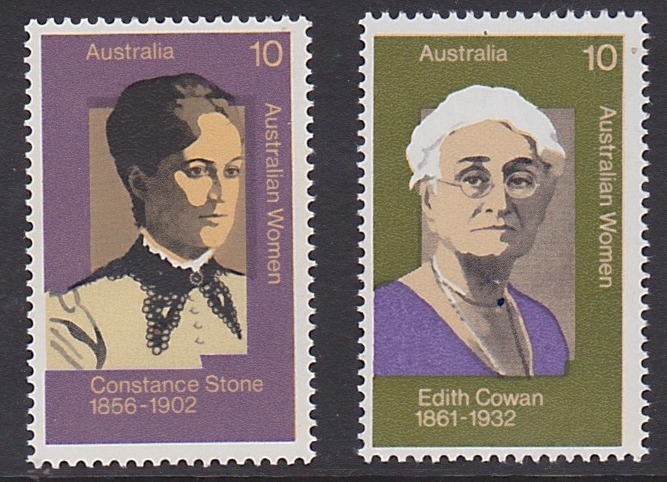 Edith Cowan, whose portrait will be familiar to most as it features on the $50 note, was the first woman elected to an Australian parliament, when in 1921 she was elected to Western Australia's Legislative Assembly. 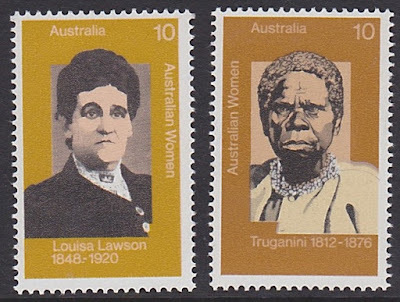 Louisa Lawson was one of the women who I was not familiar with - from her surname I was expecting her to be Henry Lawson's wife, but in fact she was his mother. But more than that she founded a printing press and was a writer and women's rights activist. Truganini's life story is enough to make your heart break. 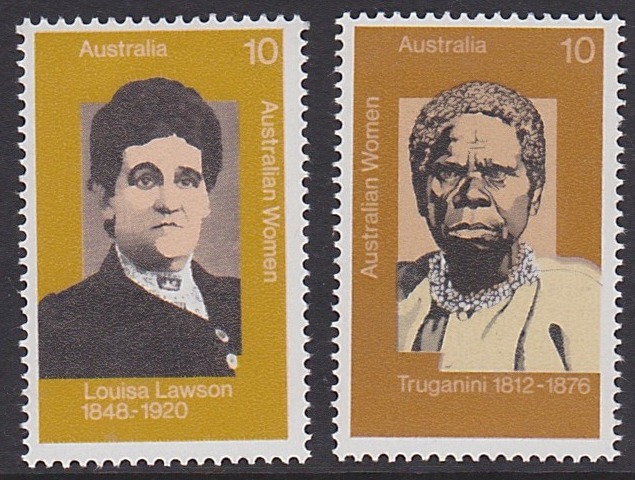 She is widely known for being Tasmania's 'last Aborigine' and despite her expressed wishes her body was put on public display in the Tasmanian Museum from 1904- 1947. A final insult. Many of these women were suffragettes, agitating for women's rights and social reform. 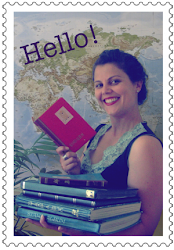 They are all quite inspiring - so I am so glad these stamps encouraged me to explore their lives a little!